Nothing says summer like tomatoes off the vine...and I couldn't wait so I actually pay way too much for vine-ripened tomatoes at the grocery but they were worth it! I've lost a little over 20 lbs since I've been following the "Glenna's No Crap" Diet, which is a combination of all the best nutrition information I know and no, you guessed it, crap. Basically, I'm cooking from scratch and looking at every label. If I don't know what an ingredient is I set it aside. For convenience sake this leaves me eating a lot of cottage cheese or natural peanut butter and homemade bread if I'm not in the mood to cook but, luckily, I'm usually in the mood to cook from scratch. This week, my craving has been for broccoli soup. I love broccoli soup when I'm out at a restaurant but there's something about that too bright orange color that hints at some not very natural ingredients...so I made my own. One of the simple tricks to this soup is something I learned from Auntie Miranda: if you want a cheddar flavor in something, the sharper, more flavorful the cheese you use the less it takes to give you the medium cheddar flavor you're looking for. Good advice, Auntie. In the south, we are traditionally horrible about overcooking our vegetables, particularly our green beans but with summer's fresh produce I've found that there really can be a nice middle between my love of my Nannie's beans with bacon and onion, and a nice tender-crisp bean with lots of color and taste. This recipe bridges the gap between the love of bacon flavor without all the saturated fat and also between a torturous cooking time and on-the-spot dinner. I also throw in some walnut pieces for extra crunch and flavor that enhances the bacony goodness. Every year I try to make at least one rhubarb cobbler for Gene. Not strawberry/rhubarb, just the 'barb itself which is his preference. This year's was tasty (made a couple of changes) and even looked pretty, although the pie crust discs I cut out look like biscuits in the picture. Hmmm...didn't think about that at the time. Oh well. 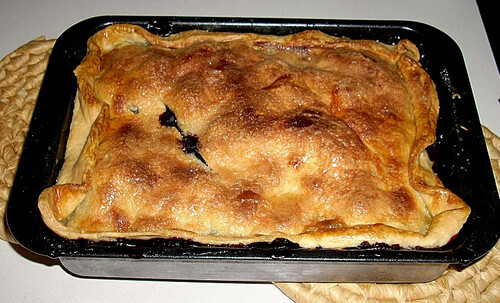 Either way, this is one of Gene's all time favorite pies. So simple and yet so rewarding, this is a summer constant in my work lunchbox and snack around the house. Only three ingredients that pack an all-out taste power punch: creamy for the tongue, crunch for the teeth, and salty herby for the psyche pleasure zone. It's also one of my favorite orders at Parlor 88, a local pub with two locations in Springfield, where they also serve nummies like curried chicken salad lettuce wraps, jalapeno popper dip, and pulled pork nachos. Parlor 88 serves the cucumber dip with lavosh (cracker bread) but at home we eat this primarily on good fibrous tough stuff crackers or I love it as a sandwich on wheat or rye bread. Middle-of-the-night Afternoon Tea, anyone? An added pleasure is anytime the cukes come from your own garden. Sigh. The best part of summer is the garden! This summer I've become more enamored and amazed by the simplicity of fruit and fruit desserts. Sure, like everyone, I love eating the summer peaches, plums, nectarines, and cherries hand over fist in their natural state, but I've also made more cobblers this year than ever before. Dad and Kenneth have been dropping off goody baskets from both Dad's garden and the Farmer's Markets Dad's been haunting this summer and one of blessings from their generosity have been blueberries. I've been eating them alone and in smoothies, but also in fabulous cobblers. Is there some complicated recipe? No. Fresh good fruit, as I'm very aware of this summer, needs hardly anything to dress it. I've been making cobblers in the toaster oven so as to not heat up the house and not have to heat the whole oven for just a small dessert for Gene and I (with a little leftover). 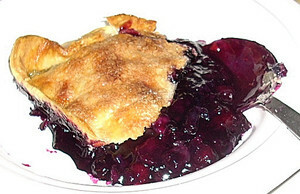 For my toatster oven pan (approx 5"x7") I used a pint of blueberries, about a 1/2 cup of sugar, a few drops of vanilla paste, and a squeeze (half) a fresh lemon. Covering it with a commercial pie crust I happened to already have in the fridge, I simply baked it off at 350 degrees for about 25 minutes, until the toaster oven nicely browned the crust. 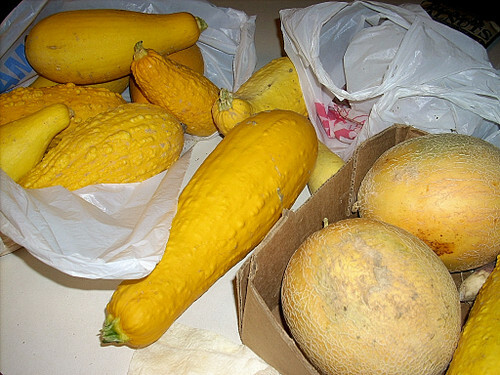 Squash, glorious squash--love anything from the garden and we've been eating a ton of this from Dad's garden! 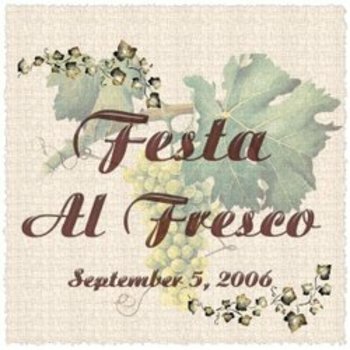 The first is a squash casserole given to me at the exact appropriate morning before a family dinner party when I was wondering how to prepare squash that evening, by my friend Sally of the Aunt Sally blog. 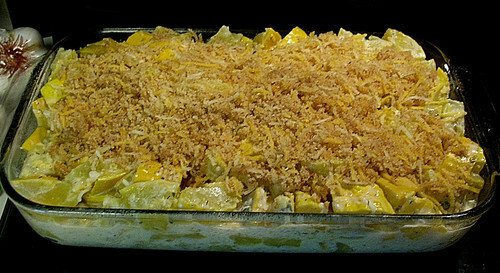 This is a really wonderful casserole, a great different way to prepare the vegetable but still nice and simple, allowing the garden sunshine flavor to come right through. I also loved that I could prepare it in the morning, stick it in the fridge, and not have to worry about it until I pulled it out to bake it off 45 minutes before my guests arrived. Thanks Sally! 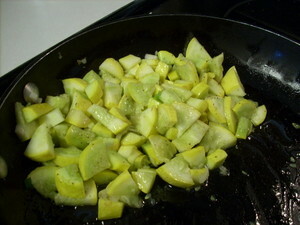 The second is my own simple preparation of squash sauteed in butter with a generous sprinkling of Cavender's Seasoning, producing locally just a bit south of here in Harrison Arkansas. Yummy stuff and so easy to perk up any dish! 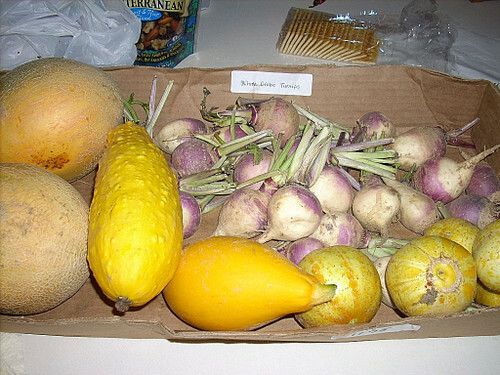 My dad retired this past year so he's been able to garden and go to farmer's markets (he intends to sell next year) to his heart's content and my brother, Kenneth, has been sweet enough to leave care packages on my front porch when we're not home. 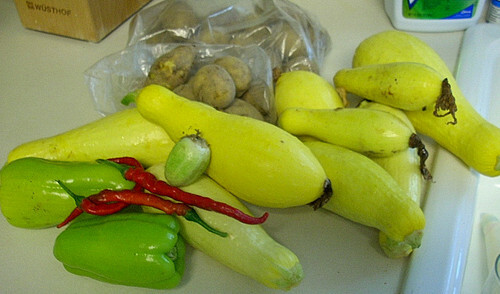 Look at all this wonderful produce (yummy yellow squash!) we've been eating up. My Grandmother, whom we all called Nannie, used to have a weekly family luncheon every Wednesday. Any and every family member who lived in town or happened to be in town or wanted to drive into town was welcome at her table on Wednesday at 11am for lunch. We all miss that tradition. It was such a great way to keep everyone in touch and to get to eat Nannie's cornbread, Coca-cola BBQ chicken, and Salisbury steak, not that we're a food-self-involved bunch or anything. 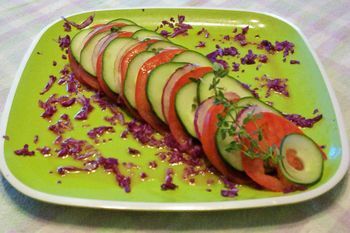 One of the summer staples of Nannie's table was was a bowl of cukes and onions fresh picked from the back yard that morning floating in a brine of sugared vinegar water. I loved the crisp snap, the juicy crunch, and the hot bite of those cukes and onions, but the one thing I didn't care so much for was the way the cukes didn't take long to get liquid-logged. The cukes didn't actually get mushy but they did lose their snap, my favorite part, after sitting out on the table and warming up a bit. I haven't had those cukes in a long time but when Ivonne of Cream Puffs in Venice and Lis of La Mia Cucina announced the virtual La Festa Al Fresca picnic the memory of those cukes came back to me and I started thinking about how to remake (everybody from the south's) Nannie's cukes and onions recipe into my own image, so to speak.